One of the greatest unknowns of the Sawtooths is this rather large lake at the headwaters of Redfish Valley. It lies atop a glacier-scoured mesa of granite batholith and is ringed by jagged, mostly un-named, peaks. It is difficult to get here, as no established trail comes even close, but the rewards of solitude and beauty are well worth the effort. There are no signs of camps here - no fire rings or tent platforms. This is wilderness, and it should be treated as delicately as possible. 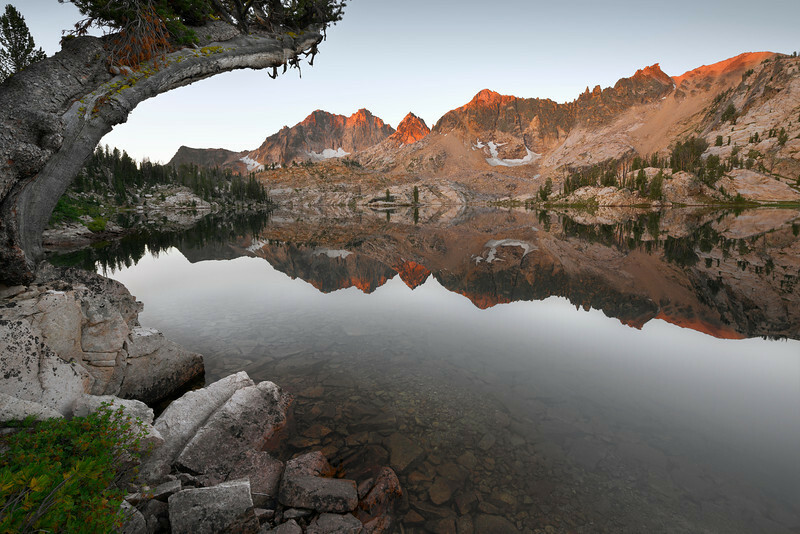 There is no reason, ever, to have a fire at high alpine lakes such as this. The warming qualities of an open fire have long been replaced by modern fabrics and goose down. So, if its just the hypnotic television quality of the fire that you need, please stay with the motorhome crowds at the designated lakeside campgrounds. This place is wild - and should always remain so.